Reply 'For Mr Baillie'. 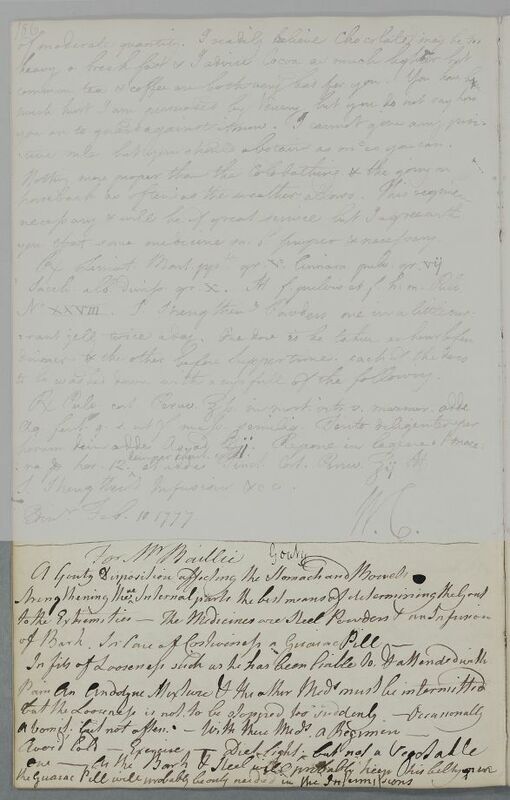 In form of brief, rough notes for a regimen, with recipes for a 'Gouty Disposition affecting the Stomach and Bowels'. 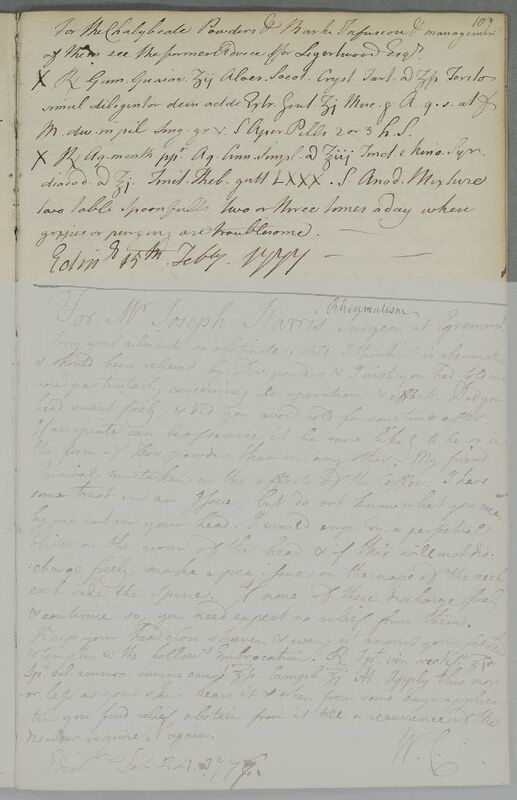 Cullen also refers back to recipes and advice supplied for Robert Ligertwood in Letter ID 3999. Summary Reply 'For Mr Baillie'. In form of brief, rough notes for a regimen, with recipes for a 'Gouty Disposition affecting the Stomach and Bowels'. Cullen also refers back to recipes and advice supplied for Robert Ligertwood in Letter ID 3999. Case of Robert Ligertwood who believes himself to have a 'nervous weakness'. Case of Mr Baillie, who has a 'gouty diposition'. Take 2 drachms of Gum Guaiacum, and half a drachm each of Socotrine Aloes and Tartar Crystals. Rub together thoroughly then add a drachm of Gentian Extract and enough Gum Arabic paste as to make a mass to be divided into pills of 5 grains each. Label: Aperient Pills 2 or 3 at bedtime. M. div. in pil sing. gr v S Aper Pills 2 or 3 h. S.
X ℞ Aq. menth. ppr. Aq. Cinn. Simpl. @ ℥iii Tinct. e kino. Syr.